23:56 What has had to change to turn the NA LCS into a revenue-generator? 30:45 What lessons are you passing on to the EU team for franchising? 39:02 Is expansion on the horizon for the NA LCS? 52:47 What is going on with the players' association? 1:00:00 Does Riot see any competition from the Overwatch League? Riot Games' head of esports for North America, Chris "Chopper" Hopper, helped implement the franchise system for the 2018 NA LCS. 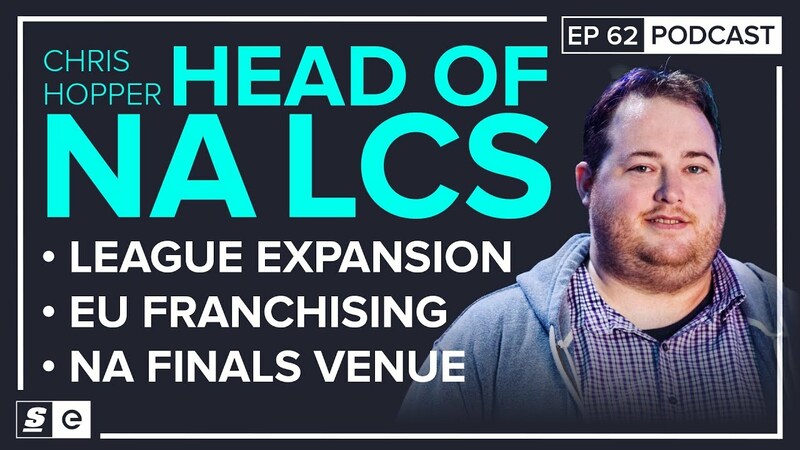 After a first successful split and just ahead of this weekend's spring finals in Miami, he appeared on theScore esports Podcast to discuss the smaller finals venue, reflect on the first franchised split, Europe's own franchising efforts, and a possible NA LCS expansion. When Riot announced that the NA LCS Spring Split finals would be held in a smaller venue than usual, some fans weren't too happy. This 2018 NA LCS Spring Playoffs are being held at The Fillmore in Miami, which houses up to 2,700, down from the 17,713-seat Pacific Coliseum in Vancouver used for the 2017 spring finals and the 12,000 seat Mandalay Bay arena used for the 2016 spring finals. But according to Hopper, the change was deliberately made as part of an effort to change up the way Riot handles the spring finals. "We're surely losing something by going to a different venue. Our hope is that we can gain something different that is similarly positive here," Hopper told theScore esports Podcast. "The problem with being one of 17,000 people at a venue is that you feel completely isolated from the show. You're part of the crowd, but you're not part of the show. Our hope here is that by having players and our fans be so close as the backdrop to the casters, be so close to the stage, such a higher percentage of them are going to get to meet the players through fan interaction that we actually end up with the players going to this show feeling a much more tangible part of the experience itself." According to Hopper, the spring finals have lower demand for tickets than the summer finals, which will likely continue to be held in larger venues like they have been in the past. As a result, moving to smaller venues for spring means that Riot has the ability to sell out the venue and go to cities with smaller player-bases, like Miami. But beyond Miami, there's also the future of the NA LCS to think about. According to Hopper, Riot and the NA LCS teams have been discussing options like league expansion, which Hopper says is coming, but won't be happening in 2019. "There's a lot of tricky factors towards expansion," Hopper said. "I think one of them is the depth of the competitive player pool and making sure that essentially by expanding we're not introducing two new semi-pro teams that are just going to get beat up on by all the current NA LCS teams. So we want to make sure that any team that going to come in will be competitive. And we also want to make sure that the economics are right, such that we're not diluting even further the revenues across the league," he said. "I would say that we're probably at least a year out from seriously considering expansion efforts in North America." Meanwhile, geolocation is something that Hopper is a little more trepidatious about. While the Overwatch League has seen some success with their so far semi-geolocated system, Hopper says that his concerns lie in disenfranchising players who are fans of a team that might not end up in their geographic region. On top of that, Hopper says his other concern with geolocation is that the core logistics of how to operate a truly geolocated eposrts league have yet to be worked out. "You look at the Overwatch League right now and every match that they've played has been in LA, and to my knowledge will be through probably the rest of the year, which means you have teams that have geographic affiliations, but not necessarily physical footprints," Hopper said. "And from a logistical standpoint, that's got to be the best of both worlds. Because you don't have to pay for travel for teams to play in all these different locations, but you can start to sort of test the waters of fan affinity in those regions and you can start to see what fandom can develop just from affiliation with an esports brand. Where they go from here in terms of the roadshow model, how they're going to do trans-continental play, remains to be seen." But Hopper added that Riot is always listening to its team owners and fans, and some elements of geolocation could be implemented as early as 2019, if the demand for it is there and the logistics make sense, and whatever happens, Riot will keep fans aware of the process. "If it's the right decision to make, we're going to make that decision," he said. "Are we looking at it, are we not? I don't know, I don't see much value in not communicating to our fans what our thinking is around some of these bigger elements. Our fans have a right to know what we're building this league into, and not just at the moment where we announce geolocation or we don't. To me, this is the core part of being a fan of a league, you care more than just the results of the games on game day, you care about the direction that it's going."